An inspirational collection of thirty-two poems going through the highs and lows of life. It is about being curious along the way and learning new things and questioning the old. About reaching higher than one thought one could reach and not forgetting oneself and being thankful along the way. The poems were selected from poetry written over a period of 5 years. 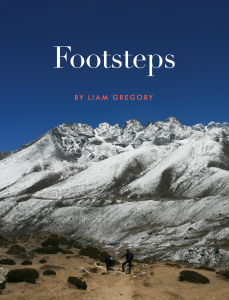 Some were written walking in the Himalaya mountains as the cover photo depicts and others in crammed busses crossing metropolitan cities. Most of them on a worn out Moleskine notebook and now released in digital form. The book can be purchased on iBooks, Amazon and Smashwords with free samples available.